Here I am with my fellow arteest- grand-daughter Karma. Guess who got the big easel? 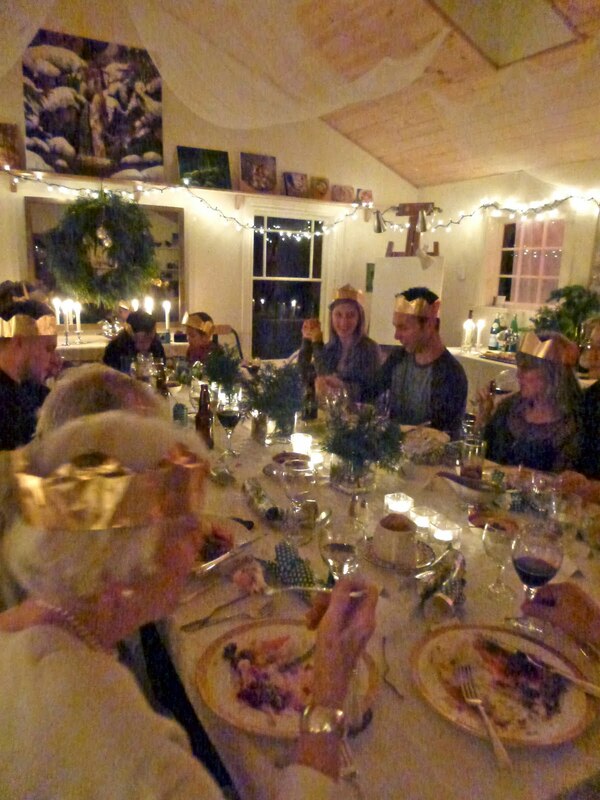 Here's the studio before and during the big Christmas dinner. We ended up with 16 people so it was busy. The weather co-operated so the walk from the house to the studio was dry. It was a real gift to see all the family gathered and enjoying each other. We had 4 generations represented, from our dad at 86 to my great nephew David, age 4. This is just a quick note to wish everyone a very merry Christmas and a joyful New Year. My energy is going towards the big family dinner that we are hosting this year- 15 people all together. I am attempting to transform my studio into a beautiful dining hall. Might have bitten off too much but I want it to be special. Once I'm finished, I'll post it on the blog. Earlier this week I taught a 3 days basic acrylics class in Coquitlam. Here's a picture of my wonderful ladies and also some of the paintings created. For a basic class, I supply the images and teach via a step by step approach. Thanks to everyone for making it such a fun three days. Here's the finished version of the painting that I posted a while ago. It was really fun to do and I was happy to avoid getting too tight with it. I feel a series of juicy still life pieces coming on- I just love the color and texture opportunities with this kind of subject. The painting is going to the Federation gallery in Vancouver for the upcoming Medal show. The opening is on Dec 8th and everyone is welcome if you are in town. "Counting the Hour" 20 x 24" acrylic. This weekend the mountain opens for skiing at Whistler and the Adele Campbell Gallery is having the opening of their annual Winter Show. This is one of the new pieces that I sent up for the show- "Indigo Sky" 18 x 36" acrylic. The gallery is in the Westin Hotel and Spa so check it out if you're in the area. 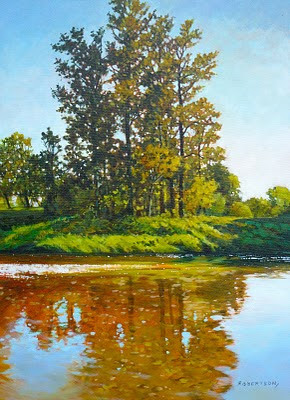 OK- I thought I had put the finishing touches on this painting but turns out my vision was different than the client's. Fortunately the changes they wanted were easy to make so this is what we ended up with. I have to admit that I might like it even more in this new incarnation. Commission are an interesting part of the journey! Today I finally put the finishing touches on this painting. It is a 30 x 48" oil and is a commission for a Vancouver client. I thought it was done about a week ago but there were things that bothered me about it, although I was having trouble knowing what to do. My sister, Suzannne, had a look at it and made some very helpful suggestions. I think I had been looking at it so long I couldn't really see it any more. I ended up doing some work on the freighter to improve the drawing and I reworked almost the entire foreground. I'm much happier with it now and am looking forward to showing it to the client. This week in my Vancouver intermediate acrylics class, we did an interesting exercise. We all had photos that we had taken of a still life set up from the previous week. 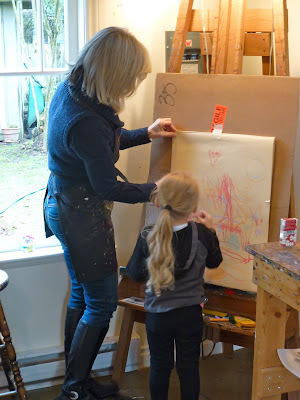 Everyone was given a bit of time to under-paint their canvas and draw in the basic composition. Then we had one hour to paint as much as we could. At the end of the hour we lined up all the paintings and had a look. Most people really enjoyed the exercise, a few chose not to do it and a couple found it so stressful that they dropped out. Hopefully they will all forgive me for putting them through it. The benefits of this exercise is that you have to very quickly decide what really matters in your painting and what you can leave out. No time to get bogged down with small details. I found it exhilarating- kind of like white water rafting. Here is my effort- 20 x 24" acrylic. I like it and plan to spend a little time bringing it to completion, while trying not to lose the freshness. Just coming to the end of a wonderful weekend. Gaye Adams was here teaching a workshop in my studio and our friend Mark Hobson from Tofino was here for the weekend too. 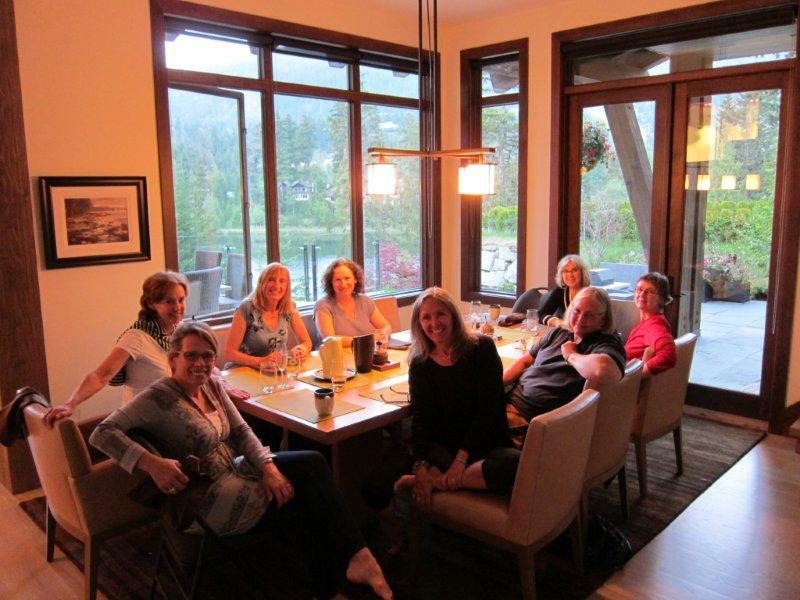 We had great conversations around the dining room table with Gaye, Mark and some of the other artist friends attending the workshop. I learned a lot about oil painting these past three days. 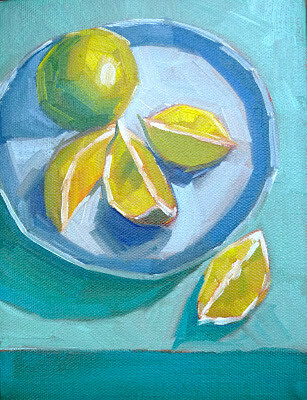 We did small oils from life- no bigger than 6 x 8". Here are two of mine. Gaye is a wonderful teacher. If you ever get a chance to take a workshop with her, I highly recommend that you go for it. 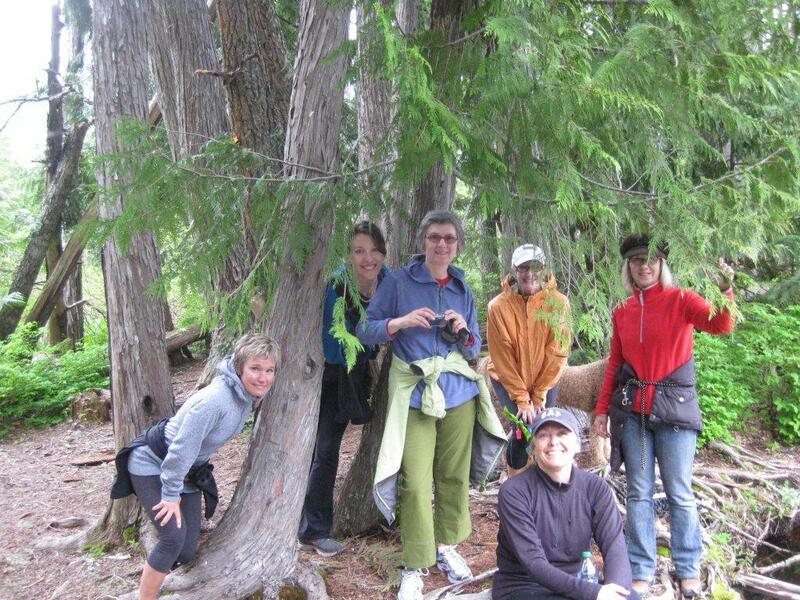 Here's a shot of our workshop group- thanks all for making it so much fun! Lots going on right now. 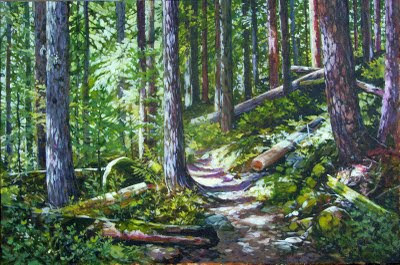 I did a very enjoyable 2 day workshop on Gabriola Island about a week ago- I had a wonderful group of people to work with and I love the natural beauty of the island. The Vancouver classes are in full swing. We only have 2 more classes after this week so it has gone by in a blur. I do a south Granville gallery crawl with my intermediate class on the final day, then we all go out for lunch together- it's one of my favourite days. Each time we do it, I'm reminded of how important it is to get out to galleries and see what other artists are doing. 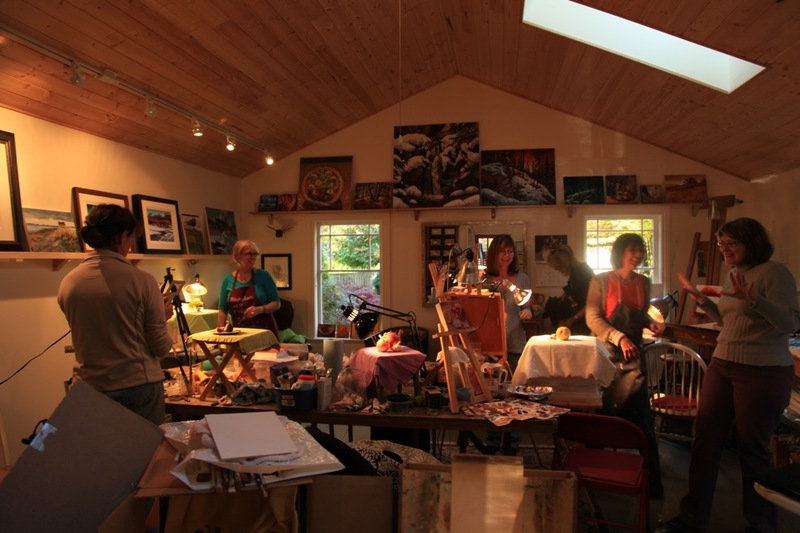 This weekend I'm hosting a workshop with Gaye Adams in my home studio. This is the first one so I'm very excited and looking forward to learning lots about daily oil painting from Gaye. Painting-wise, I'm working on a big commission for a Vancouver client. It's an image of the harbour from Jericho beach. 30 x 48 " oil. I will post it when it's done. Then I need to get busy and do some new pieces for each of my galleries for the holiday season. I think there was a bit of a breakthrough on this painting. I did each apple wet-in-wet and managed to keep the edges soft. Thinking about edges a lot right now- the next frontier! Spanish Bowl 24 x 24"
Yesterday I taught my first of 7 weekly classes in Vancouver. I do an intermediate class in the afternoon and a beginner class in the evening. It is one of the great pleasures of my life to teach and be a part of the growth of other artists. I took this painting along for my students to see and offer comments. There were some helpful suggestions given that I applied to the painting. 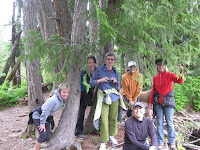 The beginner class had 9 on the wait list so we have set up another class - it will be in Coquitlam, Dec 5th, 6th & 7th. More information on that at www.artists.ca or you can contact me. I'm interested in growing myself and so I am planning to take a few workshops in the next few months. First up will be a three day workshop in November with my friend Gaye Adams. I will be hosting this in my home studio and have a small group of local painters coming to learn along with me. Next year, Alan and I are hoping to do one of the Master workshops with one or two of the rock star instructors from the USA . Really looking forward to that. 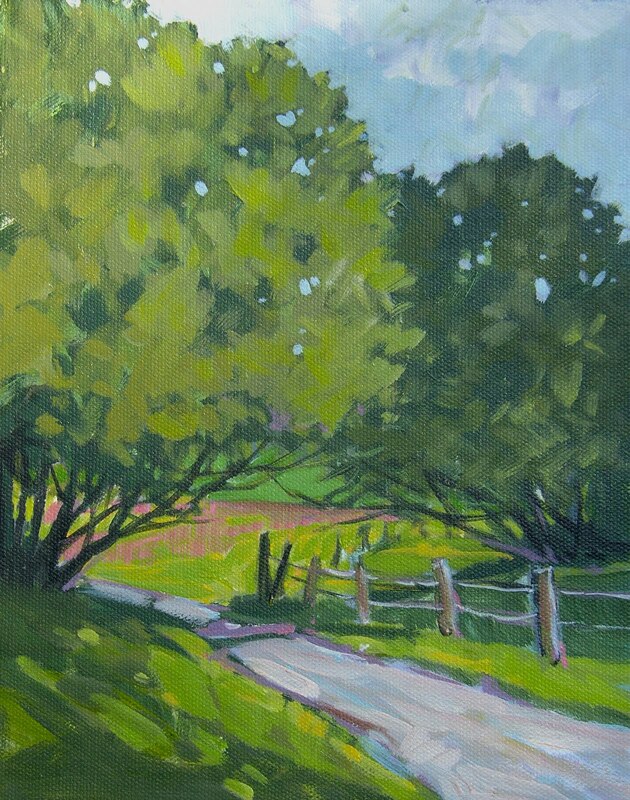 Here's a few shots from Apple Day plein air painting. We had fun and the rain held off. As you can see, Alan chose a glamorous spot near the restrooms. I haven't painted flowers for the while so decided to paint this little bouquet from my garden. I plan to paint another version of this image as a demo for my basic acrylic class which starts this week. I started with a black underpainting, which is what I will get the class to do. This class is full but I'm working on putting together a three day workshop in early December. It will be for beginners, and will probably take place in Coquitlam. I'll post the details when I have the venue and dates secured. Today my friend Judy & I went painting outdoors, about 5 minutes from home. Both of us are fairly new to plein air painting. We felt that today we took a step forward in our skills and were pretty happy with the day. Nothing better than to sit outside in a beautiful place with a good friend, two good dogs and paint. This little 12 x 12 isn't perfect, but progress is being made- that's all I ask. We're going again next week! Here's the finished painting from the photo that I posted a while ago. This painting will be in the Stave Falls group show, which opens on Oct 28th. More details on the show later. I don't have a title for this one yet- its a 24 x 18" acrylic. It's been a busy few days. Last Thursday night we went to my sister Suzanne's opening for her joint show with Joe Coffey. It was packed with people and a great chance for us to catch up with some old friends. The show is stunning- check it out if you haven't seen it- it's on at Granville Fine Arts for the week. Yesterday my husband Alan, and our good friend Mike Svob, had a show open at White Rock Gallery. A great crowd, lots of red dots and the show looked beautiful. The contrast between Alan's and Mike's work is profound- Alan; subtle, detailed and thoughtful, Mike: bold, colourful and exhuberant but somehow it all works together. White Rock Gallery has the visual presentation down to a fine art itself so check out this show if you are in the area. We got home today from a great week at the FCA workshop on Gabriola Island. Here's a couple of small paintings that I did on location, plus a shot of one of our painting groups with Alan. We got to spend time with some treasured old friends and made some new ones as well. 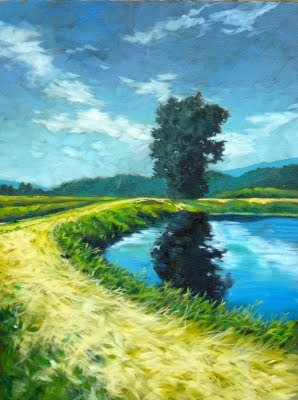 I learned something from each instructor and was grateful to be able to work on my plein air skills. I'm not where I want to be yet but the work is getting better. I'll keep plugging along and see where it leads me. 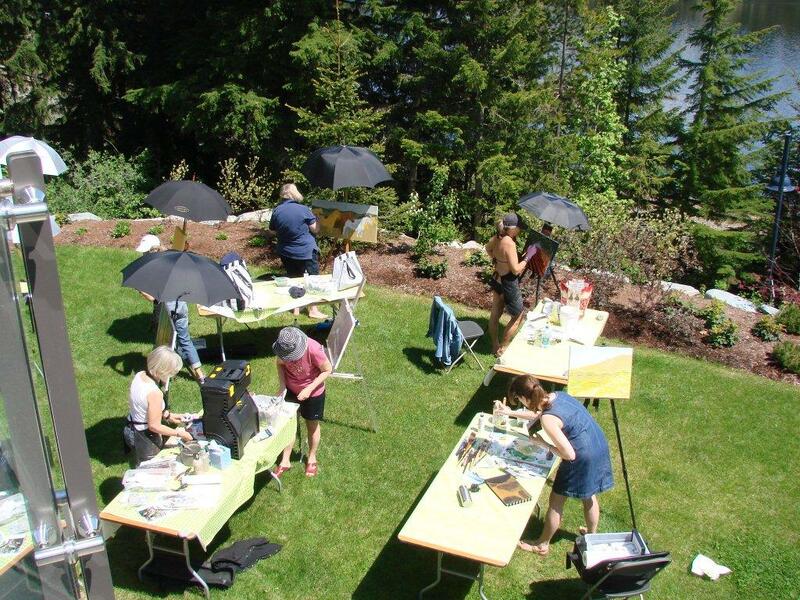 Speaking of plein air, Apple Day is coming up in Fort Langley on Oct 1st. 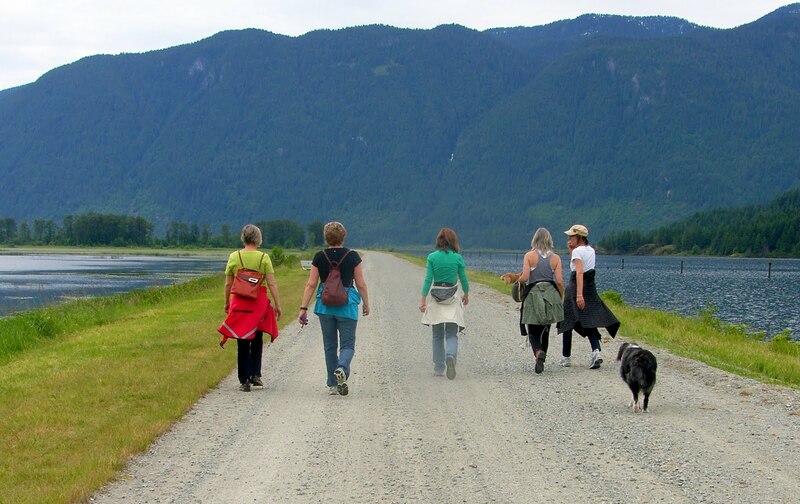 It's an opportunity to paint outdoors with a group, in a beautiful setting along the banks of the Fraser River. Email me if you'd like more info- everyone is welcome. I enjoyed every minute of painting this little guy. Seems the painting block and discontent has lifted for the moment- what a relief! Now I feel bursting with ideas for things to paint. Today I took advantage of this glorious weather that we've been getting to go on a photo hike with artist friends Linda and Judy. These are two of my favorite shots of the day. We took dogs and a picnic lunch and we all agreed that life doesn't get any better than being outside in nature, with good friends on a beautiful day. We all felt so blessed to have so much natural beauty this close to home. Next week Alan and I go to Gabriola Island for the Federation plein air painting workshop. 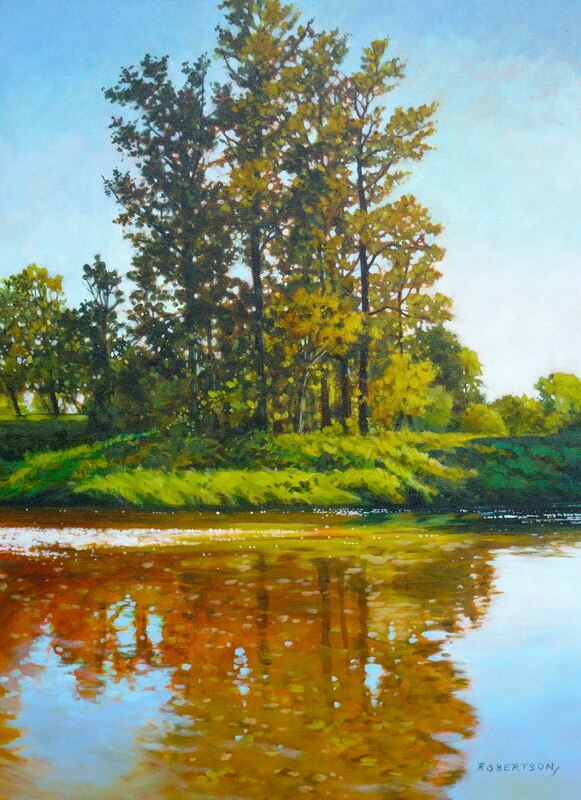 I am really looking forward to painting outdoors with the group. I'll post a few of my paintings from that on the blog if I manage to do anything worthwhile- still a beginner at the whole plein air thing. Finished this piece today. 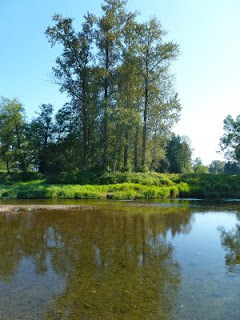 It's a river bed in the Chilliwack area. I love the color of the rocks and tried to keep the painting fairly light in value to capture the softness of the blues and greens. It's a hive of activity around our house. My husband , Alan, is getting ready for his two person show with Mike Svob at the White Rock Gallery. That opens on July 25th and it will be a stunner. Also my sister Suzanne is staying with us right now so she can paint for her upcoming show with Joe Coffey at Granville Fine Arts. That opens September 22, so check it out if you're in Vancouver. 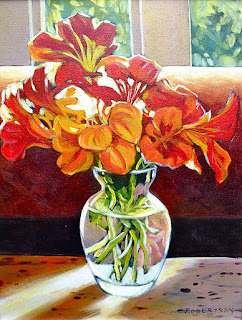 As for me, I just hung 7 paintings in the lobby of the Hollyburn Country club. They will be up for the month of September. Now I'm working on some paintings for the Stave Falls Art Group's annual show in October. They kindly invited me to be their guest artist this year. More details on that event closer to the time. Have started a new piece today that I'm excited about. 30 x 40 so it's a pretty big one. I hope this painting lives up to it's promising start. Sometimes by the end, I kill the excitement in the effort to get it right. Probably a great little metaphor for life there . People have questioned me about painting blocks. This summer there have been a few spells of them for me. Usually I avoid the studio for few days and then start to feel very weird so I get back in there and try to paint. Even if I just go in and underpaint a canvas or organize my storage or go through my reference, I find it helpful to get me started again. I'm going through a period of extreme discontentment with my work right now. Not a comfortable place to be but it happens. If the latest painting works it will help but I think I need to go back to learning. Read a little more, maybe take a workshop. Am reading Richard Schmid's book right now- his old one called "Everything I know About Painting". I find it funny that he has since written a new book. Anyway, it's a great book and very inspiring. He is such a genius painter that one might feel like just hanging up the brushes but he is definitely worth checking out f you don't know him. Reading about his process is interesting for me because it is so different than mine. I've been exploring Pitt Meadows a bit lately. 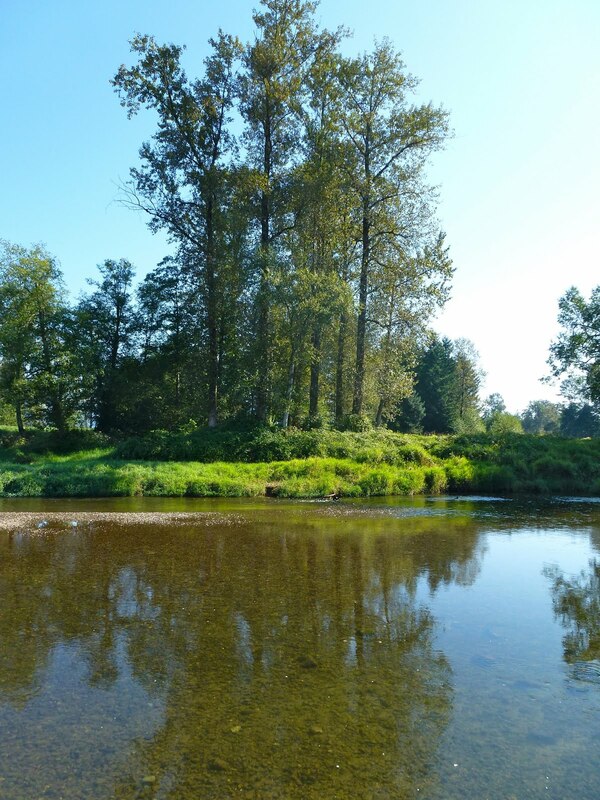 It's on the other side of the river from us and is now readily available thanks to the new Golden Ears bridge. It's a beautiful area with an extensive network of dikes, rivers and lakes. This image is typical of the area. 24 x 18" oil. Haven't thought of a name for the painting yet. Let me know if you have any ideas. We put on some music and the paint started to fly. I finished one and made a good start on a new big one. It was so energizing to have company in the studio- I'm definitely going to do it more. I started this painting about 8 months ago. First in acrylics and then I overpainted it in oils. It just never came together although there were bits of it that I liked. It sat in a corner of my studio until today when I felt like having another crack at it. I think it's ok now- I feel much more comfortable with it. I don't know why I could resolve it today after all this time. The temperature change in the sky is new and that made a big difference. I started this piece last weekend at a paint-out in the garden at the Birthplace of BC Gallery. Good thing I like painting grass! The challenge to to make it look like I painted all the grass without painting all the grass. Alan and I will be in West Van this Saturday for the annual Plien Aire paint-out at Ambleside Beach. Come say hi if you're in the neighbourhood. 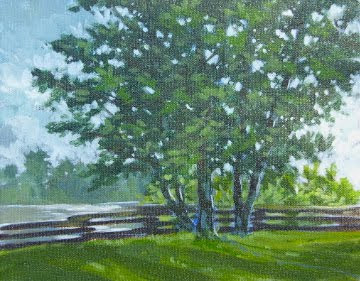 I painted these little field studies from life this morning at Derby Reach Park near Fort Langley. They are both 8 x 10 ". I have lots to learn about painting plien air but I have learned to keep it very simple for now. It' definitely a great exercise to help sharpen the paintings skills and I hope to get out and paint in the great outdoors a lot more this summer. Here's a few photos from my recent trip to Thormanby Island. I came home with about 350 images so more island paintings will be coming up. The weather was perfect and my friends Pete and Jeannie were kind enough to take me around in their boat so I could get some shots from the water. I have a photo spread of my paintings in Avalon magazine.It's available at Chapters, among other places, if you want to have a look. Avalon is a gorgeous magazine, full of art, photography, travel, architecture and fashion. Registration is now open for my fall weekly classes. www.artists.ca for info or check my website. This painting did not come easy. I loved the beginning but kind of lost my way in the middle. Consulted with my genius sister who made a few color and value suggestions, and now I'm pretty happy with it. "Sanctuary" 24 x 48" acrylic. 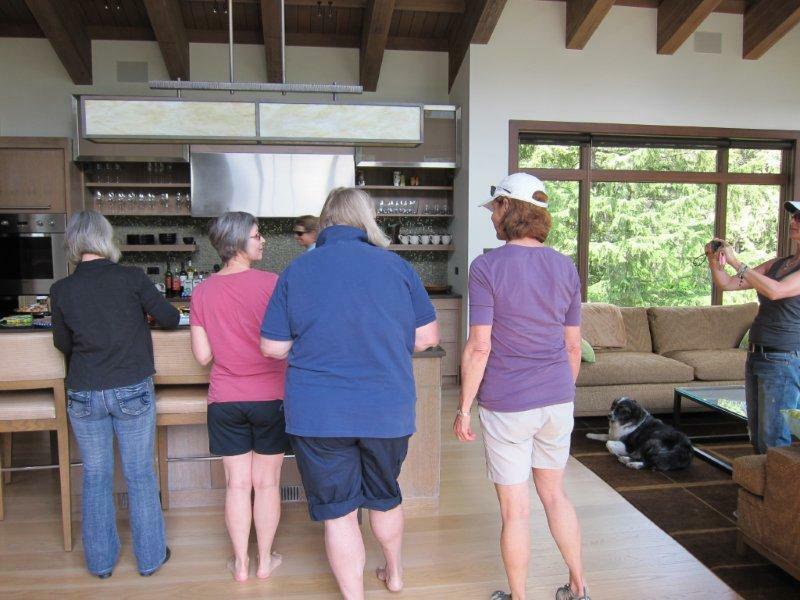 Here's how I spent my birthday- doing my favorite thing- walking around a beautiful place with dogs and some of my dearest women friends. We were at Pitt Lake in Pitt Meadows. The light was not great for photos but I did get a few good shots. Will go back when it's sunny- it is a gorgeous location for subject matter. Just finished this piece- the second Cheakamus Trial one. I started it while up at Whistler last week. It was a busy weekend with Alan's birthday, Father's day and the opening of Alan's solo show here in Fort Langley. 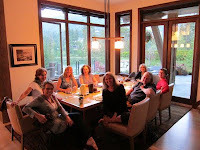 Just back from my class reunion at Lianne's beautiful home at Whistler. It was really fun to paint with the group. We went for a 2 hour hike on the morning of the second day. Thank you, Lianne, for making it happen!